Register here for your free ebook or schedule a demo of the RVI Enterprise Content Management Systems. Send me the eBook. Schedule a demo. 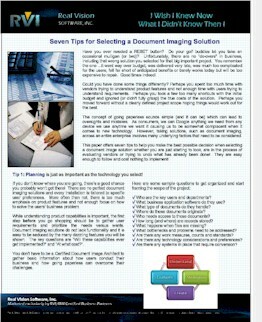 "Seven Tips for Selecting a Document Imaging Solution"
is a step-by-step process to help you organize your strategy to go paperless without having to bring in an expensive consultant. These tips are easy to follow and cost nothing to implement. Please enter your information and the link to the ebook will be emailed to you.